"Welcome to Ohio", proclaims the arch over I-70 on the Indiana side. Miamisburg Mound in Miamisburg, OH, is the largest conical earthwork in a state that has many earthworks of various configurations. It is 300 feet in diameter and was originally 68 feet in height. In 1869 an excavation attempt knocked three feet off its height but did yield a bark-covered skeleton and showed that the mound contained a lower chamber that was empty. 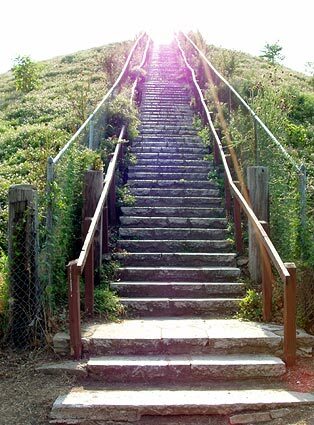 This stairway was added for tourists. The mound has never been explored in a systematic manner. The earthwork is thought to have been constructed by Native Americans who lived in the Ohio valley between 1000BC and 400AD. Information is from a plaque placed at the site by the Ohio Historical Society. 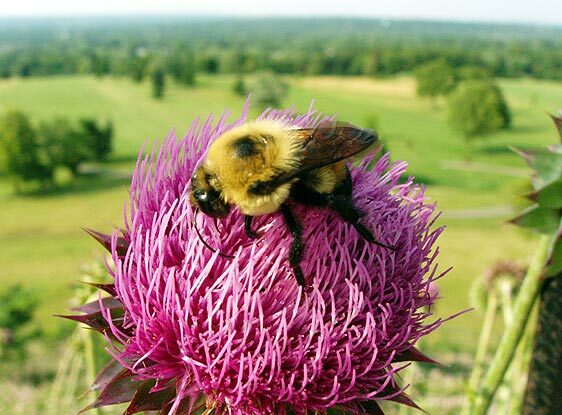 A Bumblebee avails itself of a flower at the top of the mound. There must be tens of thousands of wildflowers growing all over the earthwork. 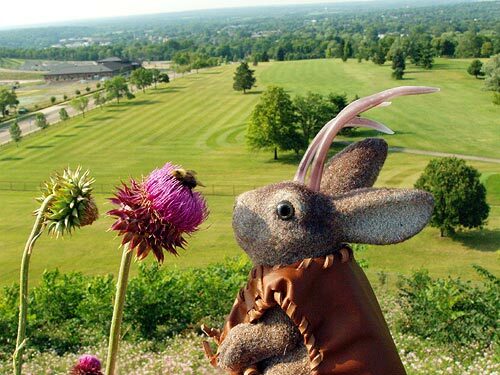 Ace Jackalope enjoys contemplating nature atop the mystery of an ancient civilization. All photos this post taken July 1, 2006. I like your blog; very interesting. I am a graduate student in Art Ed at OSU and am looking for pictures of mounds in Ohio to use in a video game I'm making for fourth graders about Mound Builders. May I have permission to use your photo of the Miamisburg Mound?